Partie méridionale d'Afrique où se trouvent la Basse Guinée, la Cafrerie, le Monomotapa, le Monoemugi, le Zanguebar et l'isle de Madagascar - DE FER, N.
Title : Partie méridionale d'Afrique où se trouvent la Basse Guinée, la Cafrerie, le Monomotapa, le Monoemugi, le Zanguebar et l'isle de Madagascar. Map maker : DE FER, N.. Size : 8.3 x 12.5 inches. / 21.2 x 31.8 cm. 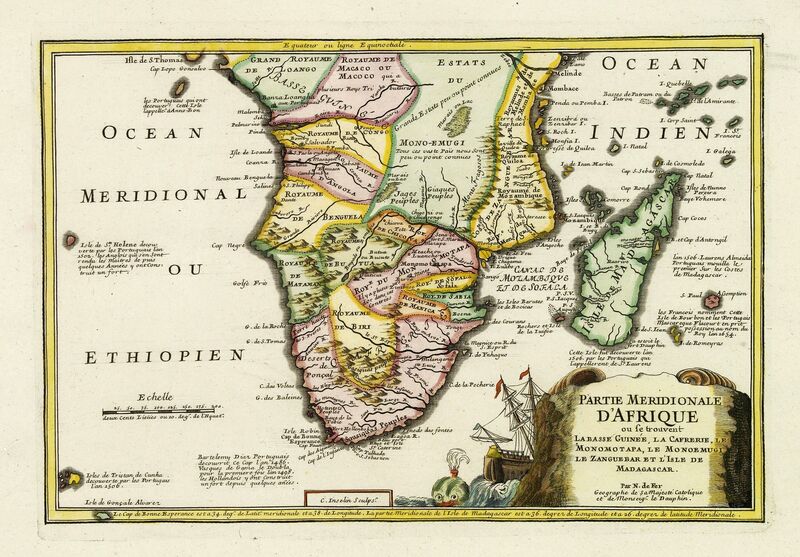 Description :The map includes Southern Africa and Madagascar. Engraved by C.Inselin. There is a small legend at the lower border describing the discovery of the Cape by Bartholomew Diaz in 1486 and the construction of a Dutch fort. From his "Atlas Curieux", published 1700-1705. Norwich, Maps of Africa, map 167.